Want to be on the top of Google instantly? Check Out These Real Estate PPC Strategies. As an agency, we have run thousands of pay per click campaigns for real estate developers, brokers, and builders in the last 10 years and know the best way to achieve the maximum return on investment. Our strategy focuses on using the benchmarking process to optimize to deliver the highest quality leads to keep your sales team in contact with buyers that are qualified to purchase your product. 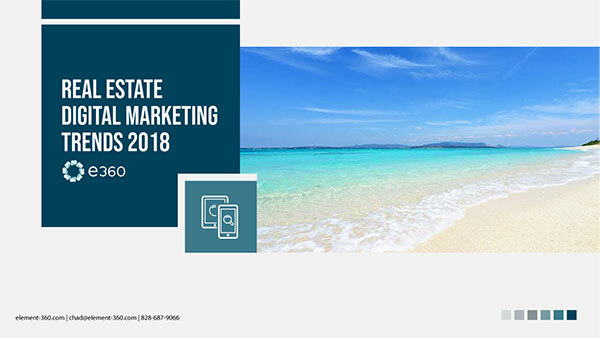 Real Estate PPC is only one type of marketing campaign we consider in the marketing mix as part of a well-rounded approach to your overall marketing goals and objectives. Our Real Estate PPC services use the Google AdWords platform. Google is the leading search engine in the world. We help you show up to the right audience at the right time. Audience intent and relevancy are highly aligned with your goals. Google shows your ad at the top of the results in a prominent position. Our ads allow users to click-to-call or click for directions before visiting your site or performing another search. Spam traffic is closely monitored and is filtered out, so you don't have to worry about wasting your ad spend. Ads show up on above organic results, see the example on the right. Identify your business goals: examples include lead generation or brand awareness. Structure your keywords into similar themes that you can use for campaign and ad group organization. Create an AdWords account and upload your campaign to the AdWords Editor. Optimize your campaign toward your business goals daily. Keyword Research helps to identify what people are searching for, an estimate on how much you can expect to pay per click, and around how many times people search for those terms. This information can sometimes be inaccurate but helps you forecast what's possible in your market. It also helps save time in the optimization process if you weed out keywords that have no search volume. Grouping your keywords by similar themes allows you to keep your ads aligned with your keywords. 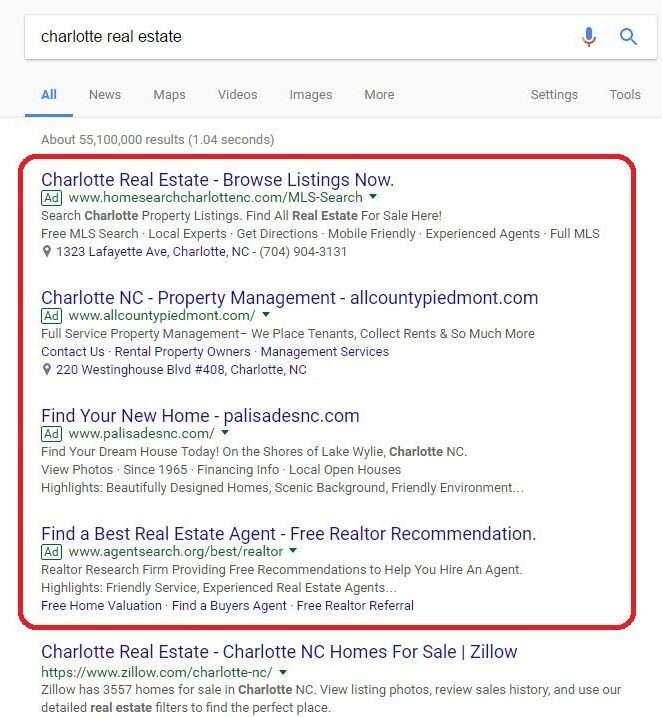 For example, 'Charlotte New Homes' and 'Charlotte Real Estate Agent' keywords shouldn't be shown the same ad if you would like to have a good click-through-rate(CTR). Broad Match (ex. broad match): This is the most widely misused keyword available in AdWords. It will allow your keyword to show up for the widest variety of searches out of all match types. If you use this match type, be careful to watch your search terms report and add negative keywords accordingly. Broad Match Modifier (ex. +broad +match +modifier): Broad Match Modifier allows you to select which words are in a users' search in any order. Though this match is more defined than broad match, be sure to monitor your search terms report and add any irrelevant searches as negative keywords. Phrase Match (ex. "phrase match"): Phrase match allows your ad to show when people type your keyword in the order you specify however still shows when users add words to their search. Exact Match (ex. [exact match]): Exact Match keywords only show ads when that exact search is performed by a user. If you're uploading a simple campaign structure, go ahead and upload it manually. Otherwise, check out the AdWords Editor. This tool helps us upload our campaigns from a spreadsheet using a simple copy/paste feature. Lead Generation: There are several conversion rate optimization tactics you can use for this. Check out our Real Estate Lead Generation page for more information. Awareness: Focus on maximizing your impression share through keyword bid strategies or manual optimizations and budget adjustments. Driving Traffic: Focus on maximizing your click-through rate and impression share for the lowest cost keywords in your campaigns. Try to consider user experience traffic and make sure you're not driving traffic that isn't interested in your site. Headlines including New & Location drive more Walk-ins. Headlines including Location & Price or New Homes & Price generate more phone calls. Communities' submarket emphasis strategy continues to produce high-quality leads by user experience. Branded Campaigns are an essential part of a well-rounded strategy to protect the brand from competitors bidding on your brand terms. Call-Only Ads Make the Phone Ring for both branded and remarketing campaigns. After you have built your campaigns, start paying attention to the number of clicks you have generated. Think of that as your sample set for the purposes of analysis. As you review through your results think about the geo-demographics of your audience by such variables as gender, time of day and geography. You may find all sorts of opportunities to improve the quality of your traffic and leads by upping the bids on variables like these. If you would like to learn more about how we became one of the top real estate PPC companies and how that can help you improve your business growth please consider reaching out to us. Don't have the time to manage this yourself? Tried it and didn't get the results you were looking for? Our managed services for real estate PPC are one of the top performing channels at Element-360 for lead quality and volume. We've detailed some of our process above, but we haven't given up all the details around the process that we use to generate the highest quality leads and traffic. Reach out today for an audit of your campaigns or to discuss what our real estate PPC management services can do for your organization.